The answer is 68 cases of polio on the planet. (2) And of those 68 cases of polio, 59 of them were in Pakistan. So how does a one in a billion risk of polio translate into "an extraordinary event" which constitutes a global public health risk? It doesn't, of course. Unless you are a quack science public health organization trying to use fear tactics to scare the entire planet into buying polio vaccines. That's what the WHO is best at, of course: declaring false pandemics to cajole governments into stockpiling vaccines they'll never use. Remember the swine flu pandemic of 2009 during which the WHO declared a phase six pandemic? It turns out most of the WHO's advisory board members had financial ties to vaccine manufacturers. Governments around the world purchased huge stockpiles of swine flu vaccines, then later had to pay even more to have them destroyed when they weren't needed. Is one in a billion really a global pandemic? When the mainstream media throws around the phrase "global pandemic," it brings to mind images of mass global death with millions of body bags and a catastrophic contagion. But the more factual reality of near-zero infections in all countries of the world except one doesn't make for good vaccine propaganda, so the press never reports the real truth: "Hey Americans! You have a million times higher risk of being killed by a pharmaceutical than contracting polio!" Consider the fact that each year, 80,000 Americans are rushed to emergency rooms due to acetaminophen poisoning from taking over-the-counter painkillers like Tylenol. Around 500 die each year, yet the WHO doesn't call this an "extraordinary event." NSAID painkillers kill at least 16,500 Americans each year according to science published in the New England Journal of Medicine (3). The WHO somehow doesn't consider this a "global health emergency," either. An astonishing 98,000 children are injured each year jumping on trampolines. (4) Yet the WHO has never declared trampolines a global health emergency. Perhaps that's because there are no "trampoline vaccines" to sell to the public. Swimming pools result in about 3,880 drownings per year in the USA alone, according to the CDC (5). Yet those thousands of deaths are not declared an "extraordinary event" by the WHO. Once again, there is no vaccine to prevent drowning. Dare we even look at auto accidents? In the USA, over 25,000 people are killed each year while driving in their automobiles. (6) Clearly this dwarfs all global polio cases by orders of magnitude. Yet the WHO has never declared driving a car to be a "global health emergency." Could it be because there are no vaccines for sale to immunize people from auto accidents? If you look at the real story behind the corrupt, anti-science W.H.O. organization, a peculiar pattern emerges: Nothing is declared a global pandemic or health emergency unless there's sufficient money to be made from it. The W.H.O. is entirely controlled and dominated by pharmaceutical interests, of course, and it is used as a weapon of fear and control over the people of the world to terrify them into buying medicines they almost never really need. In all this fear mongering "sky is falling" panic, guess what they aren't telling you? 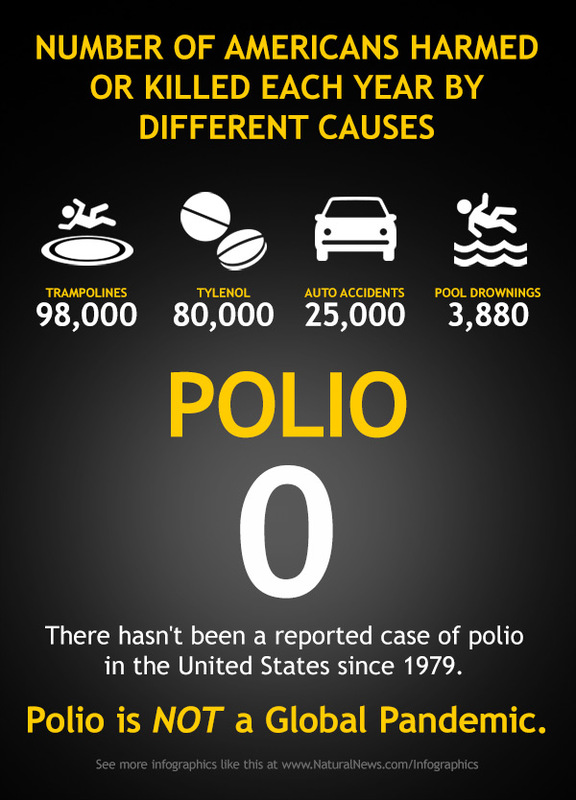 That the United States of America hasn't had a single polio case since 1979. 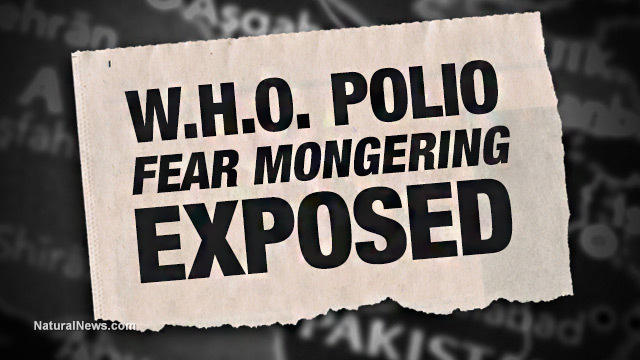 Yep, for 35 years, there has been no polio in America. According to the CDC, the mainstream media, and all vaccine manufacturers, this is entirely because polio vaccines eradicated the disease in America, and therefore this is why everybody should keep getting vaccinated against polio. Anyone with a functioning brain should immediately see the fault in this logic: if polio is an infectious disease, and nobody in the USA has it, then on what basis should every child in America be vaccinated against it? In other words, polio is gone but you should get vaccinated against it anyway, even though your odds of even being exposed to polio in the United States are virtually zero. Alongside this medical sham pushed by the CDC and the WHO, medical authorities never admit that 98 million Americans were injected with polio vaccines containing cancer-causing viruses. * Polio has been eradicated from America for 35 years and no one has it here. * Therefore, all American children should be immediately vaccinated against polio as if their lives depended on it, even though they really don't. * Polio vaccines have never had any problems and never caused cancer, they imply. The real history of polio vaccines causing cancer is no longer "official" history and therefore it never happened. So you're supposed to believe polio vaccines are now and forever more safe and trustworthy. Because they would never lie to you, would they? Oh, and pay no attention to the fact that polio vaccines are causing paralysis symptoms in children across India, most likely due to the deadly toxins and heavy metals that are customarily formulated into vaccines. For the record, I am not an opponent of the idea of immunization, and I'm not against single-dose vaccines formulated without toxic adjuvants, heavy metals and stealth cancer viruses. What I'm against is the kind of pure vaccine quackery routinely practiced by the WHO and CDC, both of which have been caught red-handed wildly exaggerating a small number of local infections into global pandemic scare stories to sell more vaccines. Both the CDC and WHO are run by people who are frankly guilty of criminal racketeering, using their offices of influence to swindle the public instead of providing accurate, sober information on genuine infectious disease risks. Today, both the CDC and WHO function as little more than corporate-controlled vaccine front groups which have destroyed every shred of scientific credibility they once held. Instead of believable, high-integrity science-based organizations, they have become The Boy Who Cried Wolf over and over again, in an effort to sell more vaccines nobody needs. And in doing so, they have desensitized the population against future warnings about genuine outbreaks of global pandemics that may yet arrive and pose a legitimate threat. Sadly, at this point we cannot believe anything the WHO or CDC says about infectious disease because we now realize their pronouncements are motivated by corporate profits rather than public health. 1) Call for the removal of all toxic heavy metals (mercury) and neurotoxic ingredients from vaccines, including formaldehyde, MSG and aluminum. 2) Encourage populations to enhance their own natural immunity through healthy lifestyle choices such as taking vitamin D supplements, increasing intake of immune-boosting fresh fruits and vegetables, and reducing environmental exposure to immunosuppressing toxins such as pesticides, acrylamides and chemical food additives. 3) Stop exaggerating and sensationalizing small numbers of local infections into global "medical scare tactic" campaigns. Instead of trying to scare everybody into buying more vaccines, publish rational weekly updates containing scientifically-validated risk assessments that accurately explain the risks of contracting polio, or MERS, or swine flu or whatever new outbreak the system is concerned about. 4) Stop the false claims that vaccines carry zero risks. All medical interventions -- including vaccines -- must be scientifically assessed in terms of risk vs. reward. The false paradigm of the vaccine industry is that vaccines are 100% effective with 0% risk. This is blatantly false and medically negligent. All vaccines carry some level of risk of serious side effects, including paralysis and even death. Although this risk may seem small for one individual, when the CDC openly encourages mass vaccination across 300+ million Americans for a disease that does not even exist in this country, the aggregate risk of deadly side effects is substantial and cannot be dismissed by the kind of quack science sleight of hand practiced at the CDC today. Anyone who claims vaccines have zero risk is a liar. All vaccines come with risk of side effects and even death. Anyone who claims all Americans need to be vaccinated against a disease that hasn't appeared in the United States for over three decades needs to have their head examined. When the entire system of immunization propaganda is based on the outright denial of medical risk reality coupled with the routine sensationalizing of irrelevant local events into "global health emergencies," then the system has morphed into little more than the laughing stock of true scientific thinkers. I would love to find a way to respect the CDC and the WHO, but that will only happen if these two organization begin to practice high-integrity science in the public interest rather than vaccine quackery laced with shameless corporate propaganda. The simple truth is that 59 people in Pakistan do not, in any way, constitute a "global health emergency." The real global health emergency is the medical ineptitude of the WHO and CDC -- two organizations that work hand in hand to create mass fear, confusion and obfuscation about the true risks associated with infectious diseases and their potential treatments. In the mean time, if you are planning on visiting the hospital wards of Pakistan, you may indeed wish to get vaccinated first. But barring such exotic travel intentions, your risk of contracting polio is as close to zero as you'll ever get in the world of medicine.